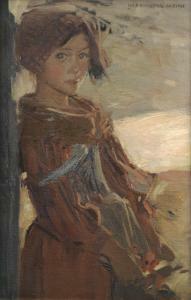 Find artworks, auction results, sale prices and pictures of Harrington Mann at auctions worldwide. with The Fine Art Society, London, June 1992, no. 176, where acquired by Justin Coldwell and subsequently hung in the drawing room at Linley Hall, Shropshire. 127 x 101.6cm (50 x 40in). 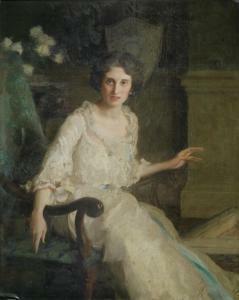 For a comparable painting of Miss Mary Nairn by the artist please see Sotheby's London, 25 November 2004, lot 424. Collection of the Van Sminia family, Landgoed de Klinze Estate, the Netherlands. 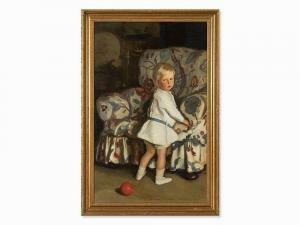 This portrait by Harrington Mann was painted in 1913 and depicts a little blond boy in front of a large armchair. With big blue eyes he is meeting the viewer\’\’\’\’s gaze. A red ball, with which the boy has probably played until just now, is lying on the floor. The finely composed background – here Mann\’\’\’\’s talent as a stage painter becomes evident – is painted in muted colors. Thus the figure of the boy in a bright white dress and with red lips as well as the colorful toy stand out before the background. Mann\’\’\’\’s color scheme shows the influence of James Abbott McNeill Whistler, while his bold brushwork is reminiscent of John Singer Sargent. Harrington Mann created numerous portraits of children, which he painted with devotion and a delightful charm. The painting is signed and dated lower right \‘Harrington Man 1913\’\’\’\’. There is a label of a London antiques dealer with a delivery address for the Ritz Carlton Hotel in Philadelphia attached to the back of the stretcher. It is in good condition consistent with age; there is a small restoration backed with a patch of canvas in the upper center. Examination under UV light reveals spots of retouching. The frame shows light signs of wear. 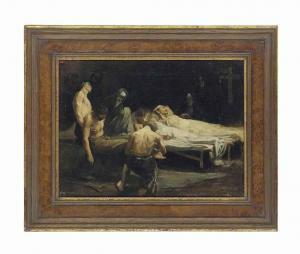 The framed work measures 141.5 x 94.5 cm, the stretcher measures 124.4 x 78.7 cm. 43 x 28.5cm (16 15/16 x 11 1/4in).